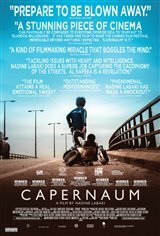 This is a most impressive and revealing movie of life in Lebanon.. This kid (actor) deserves an Academy Award.. Just a FABULOUS movie.. Plot, scenery, and emotion.. True Grit.. The magic of film and storytelling is all right here. !! Better than any other Oscar movie I have seen! It was better than any of the movies up for the Oscars. Absolutely amazing movie, it's heartbreaking. it's humanity scratching. It will leave you speachless as you leave the theater, needing some time to process the human suffering, living in poverty and young girls marriage among other real life issues. The cast were so real and the boy is phenomenal. The fact that Nadine didn't pick known names for the cast, reflects the depth of her story and not to be sidetrapped by the big names. Zein is a true Star. It’s amazing, engrossing, and heartbreaking. It’s unlike most anything I’ve seen. A brilliant moving film! moving! This is an amazing work of art! Absolutely fantastic! What a powerful and moving story. The lead boy was incredible in his role. Movie making at it's best.